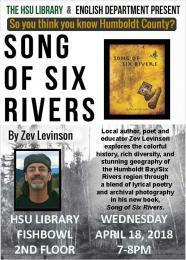 Local author, poet, and educator Zev Levinson explores the colorful history, rich diversity, and stunning geography of the Humboldt Bay/Six Rivers region through a blend of lyrical poetry and archival photography in his new book, Song of Six Rivers. Join us on Wednesday, April 18th at 7pm in the Library Fishbowl as we continue to celebrate National Poetry Month at the Library. For more information, see HSU Press' 1st Fiction and Poetry publication: Song of Six Rivers by Zev Levinson and the Humboldt State Now article, Poetic, Vivid Exploration of North Coast History.